Would you like to travel more for less? So many amazing travel destinations, so little time (and money!). It’s a big world out there and to make the most of it, you’ll need to make your travel budget stretch further. You can do free stuff while on the road, you can eat budget meals, you can hitchhike (if you really want to) but you’ll really see most savings if you can cut down the cost of your flights. After all, flights are one of your biggest travel expenses! Unfortunately, most people don’t know the tricks to finding cheap flights. They simply do a quick search, find a flight that seems okay and book it. What they don’t know is that they could be saving huge amounts of money by knowing a few clever hacks. 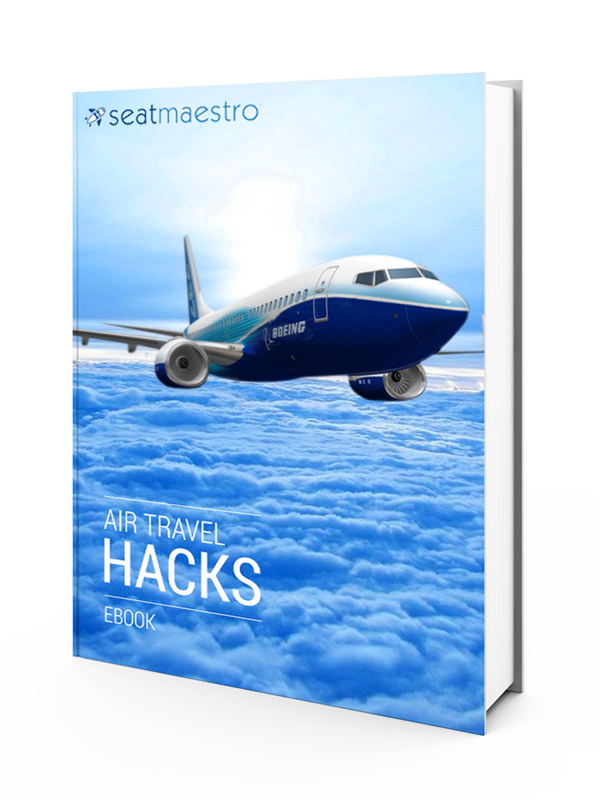 That’s what you’ll find inside our Seatmaestro's Air Travel Hacks Ebook. This book is packed with smart hacks that you can use to find cheaper flights, no matter where you are going. It was written by a frequent flying businessman who has spent thousands of hours in the air, visited hundreds of destinations and eaten countless tiny bags of peanuts. Tips and tricks that anyone can use for getting a cheaper stay in a hotel. A clever body-clock hack for getting over jet lag, so that it doesn’t slow you down and waste your precious travel time. A technique for booking airline tickets that will drastically reduce the price, without adding any extra time to your journey. How to find the cheapest business or first-class tickets and “upgrade” yourself once you have bought your airfare. How to use layovers to your advantage when booking a flight. The exact amount of time you should wait before booking your flight in order to get the best price. The best day of the week to book tickets,as well as the cheapest day of the week to fly. A simple trick you can use when booking flights on your computer to find lower prices instantly. Why the country you fly from matters - and how you can get around this. How to choose the best flight for you, based on VALUE. What a Mileage Broker does and how you can use their services for HUGE savings. How to use Wikipedia to find cheap flights (Seriously!). There’s also a section in the book devoted to airline miles and how to use them as effectively as possible. You’ll even learn when to use your points and when it is better to use cash. You’ll also learn about how to choose the best seats on the airplane, so that you can have the most comfortable and quiet flight with plenty of legroom. For only $4.99, this ebook packs in a TON of useful information that you can apply to your next business or pleasure trip to save big!